Due to the high number of requests for this service, we have changed our policy. Please read this section carefully before contacting us! There must be at least 5000 people in attendance at the event. You must contact us at least two weeks in advance. Must be an annually recurring event. We don’t usually do one-time events unless they are very large. We specialize in events in which we can be the ATM service provider yearly. Must complete Event ATM Service Information Form at the bottom of this page. Please do not call our office requesting mobile ATM services. If you call us about an ATM for your event, you will be redirected to fill out this form since these are the questions we will need to know anyways. Should be willing to make a $500 deposit. We require an upfront deposit of $500 which will be held throughtout the event and the full-amount refunded at the end of the event if the ATM makes more than $500. If the machine doesn’t make $500 at the event, then you will owe the difference of $500. This is not always necessary, but many times it is the only way we can provide this service without taking a risk. If you are in need of short-term mobile ATM services for event you have come to the right place. Prineta is a nationwide ATM vendor capable of providing reliable mobile ATM solutions… anywhere. We are one of the few ATM companies in America who deploys mobile event ATM machine services nationwide. For mobile events we have special wireless standalone mobile ATM machines that can be placed virtually anywhere. We will strategically place the ATM(s) throughout the venue in the most convenient places (and near where cash is needed), typically in close proximity to the drinking establishments and vendors. We specialize in large events. Prineta specializes in large events with over 10,000 attendees. If you have a large multi-day event we can keep ATM queues short and deploy as many ATMs as you need. In cases where the special event is covering a large area, we can have multiple mobile ATMs placed throughout the entire venue to ensure everyone can find one. We have experience providing temporary ATMs for large crowd public venue events at amphitheatres, convention centers, and stadiums with more than 100,000 patrons in attendance. Mobile ATMs for events anywhere – indoor or outdoor. 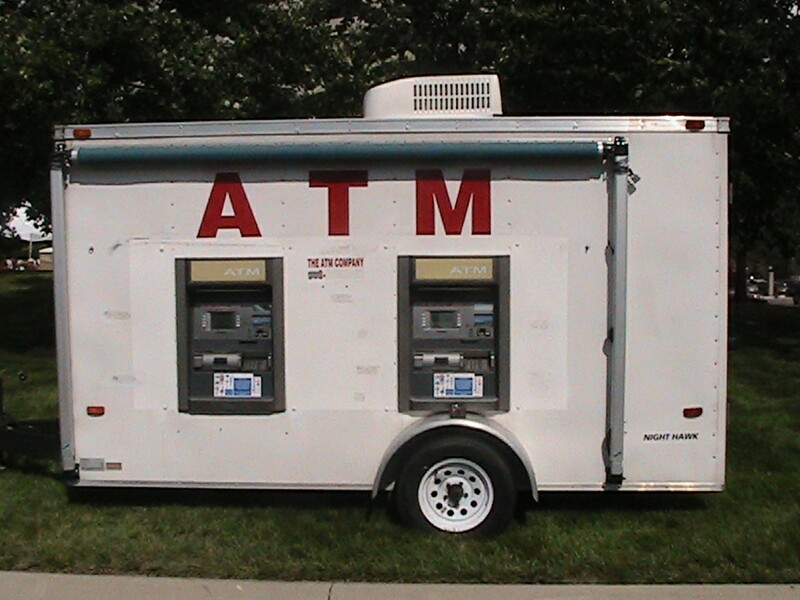 Mobile standalone ATM placement can be done for both indoor and outdoor events. Some of our standalone mobile ATMs are weatheproof and can handle light rain and weather, but we usually place the machines under tents to be sure they are safe from any problems. Our ATM tent can also provide a safe place for patrons to take shelter from the rain during sudden downpours. 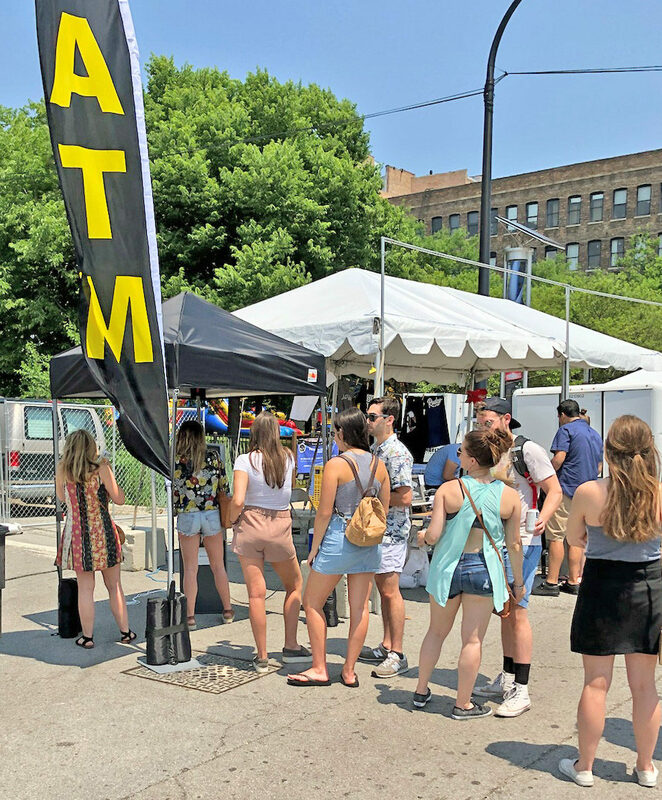 Attendees at an event in Chicago lining up for the ATM tent! We have mobile ATMs mounted on trailers. For large outdoor events like festivals, we often bring out a mobile ATM trailer and typically park it where the biggest crowds gather; near the main stage. 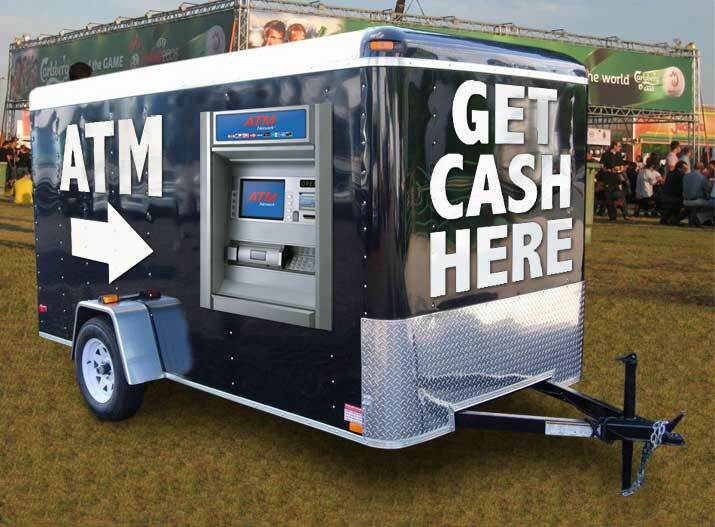 This “bank on wheels” makes ATM services for events incredibly easy because of it’s convenient setup: just back it up, put it in park, plug it in and and open up shop. If power outlets are limited we can run a long extension cord and in some rare cases the ATMs in the trailer can be powered by a generator to keep them active when power is not available. We have mobile ATM trailers available nationwide, but only in select cities. The ATM trailer often hits the road and is on the move from one location to the next. For this reason, availability is limited! Most of the time event planners will contact us well in advance to reserve dates for the trailer. To find out if we have a mobile ATM trailer available in your city, simply contact us and ask. Or any special event situations that don’t have a permanent ATM on site, and need portable or mobile ATM services. The people attending the event will want you to have one, and many times, it’s expected. If you don’t it could decrease customer satisfaction. Having the ATMs at the event provides convenient access to cash and makes it easier for people who attend your events to do more business with you. Having an ATM at your temporary event will Increase consumer spending. It has been shown that over $0.75 of every dollar that is withdrawn from an event ATM, is actually spent at the event, and the cash is re-circulated right back into the event, thus increasing profit margins for vendors employed at the special event. Vendors will enjoy directing customers to the nearest ATM. Keep patrons within the gates longer. Customers are less likely to use their credit card when their wallet is stuffed full of cash. As a result, you do not have to pay as much in processing fees due to the reduced number of card transactions. We have a large network of ATM technicians across the United States so no matter what state you are in, we are there also. Our mobile ATM offerings are different in every city. Many, but not all, of our local ATM providers are capable of doing mobile ATM services. In some cities we might be capable of deploying 20 weatherproof ATMs and a trailer for your event and some cities we might not have anything available at that time. Just contact us and we’ll let you know what is available for your particular area. At each large venue we cater to we will have experienced on-site mobile ATM technicians that constantly monitor the mobile ATMs at your event to make sure they are running smoothly, are secured, and have plenty of cash to dispense. Security – From the moment we deploy our mobile ATMs at your event we will have designated security personnel constantly monitoring the security of the machines 24/7. We will make sure the ATMs are safe the entire time until the machines are removed by our technicians at the event end. Technical Support – If there is ever any technical problem which happens during the event, we will have our ATM technicians on-call and ready to fix the issue at moments notice. At most large events we will have experienced on-site technicians who ensure that every mobile ATM is online, dispensing cash, and operating properly all the time of your event. Cash Loading – Our technicians will continuously monitor the cash levels of every mobile ATM with real-time web reports and low-cash notifications. Through the duration of the event we will replenish large supplies of cash in the ATMs without an interruption to your patrons. Regardless of the time or day, the ATMs will always be loaded with enough cash. We are capable of supplying the cash demands for events that take place busy weekends, when the banks are closed, and access to large amounts of cash is limited. 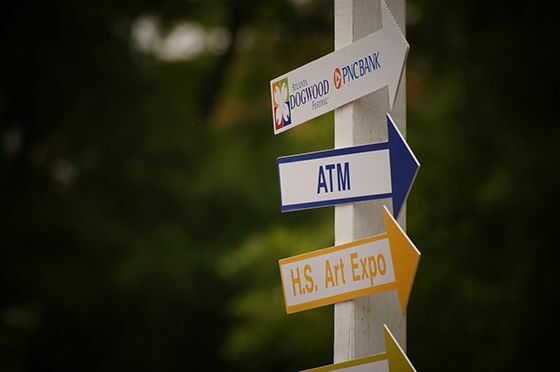 Usually for portable ATM events we provide ATM signage which is placed around the event and the ATMs so that no matter where a customer is at the venue, they can easily locate an ATM. Most mobile ATMs will have well-lit ATM toppers that provide great visibility during evening hours and make the machine taller to attract attention. Attaching a bunch of balloons to the ATM can be a great strategy for getting the customer’s attention. In some situations we can deploy the towering 20+ ft ATM flags for maximum visibility in crowds. For some locations the ATM will stand unused for temporary periods of time, such as at a conference center, in between events. For these locations we sometimes have heavy duty black vinyl ATM covers which protect the ATM and give it an inconspicuous and professional appearance. All of our mobile ATM Machines are fully ADA compliant. This means that the ATMs are handicap accessible so that everyone may have access to cash. The machines include several features that assist everyone in completing a successful transaction. Every machine includes audio assistance headphone jack and standard A.D.A. compliant keypad configuration which includes braille decals for the visually impaired. They also have lighted LED indicators which prompt the hearing impaired. The height of the machine iis also low enough so that it’s wheelchair accessible. If you are an event organizer/planner in need of mobile ATM services for your next special event, please fill out the contact/information form below and we’ll let you know if we can help.